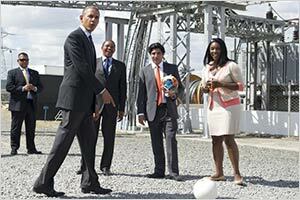 Former US President Barack Obama’s Power Africa initiative has showered Kenyan green energy projects with grants totalling Sh650 million in efforts to accelerate electrification. Mr Obama still launched Power Africa as a policy tool to unravel and activate investments in the continent’s energy space as a way of driving out energy scarcity. “with the help of US Trade and Development Agency, Power Africa has provided grants and assistance worth $6.5 million (Sh650 million) to assist development of eight new energy projects totaling 281 MW in Kenya,” the agency commented. The initiative rallies like-minded institutions and private investors towards energy financing and development in Africa, through implementation of new green projects and upgrade of actual ones for optimal output. In April 2017, Power Africa was appreciated as power producer KenGen a grant of Sh50 million ($500,000) to expand new equipment at its Olkaria geothermal power plants geared towards tapping more electricity from steam wells. At the same time, the agency delivered Nairobi-based Xago Africa Sh110 million ($113 million) in grants towards installation of Kenya’s first large-scale solar energy storage battery for a 40 megawatts solar plant due to be constructed in the lakeside county of Siaya. Besides the grant, the local company stood to gain from technical support from North Carolina-based battery storage manufacturer Alevo USA. The back-up battery is for securing reliable power supply of electricity to the national grid from the Siaya power plant even when there is no sunlight. Akiira geothermal project in Naivasha, which is also owned by investment firm Centum, is yet another plus point. It gained a Sh100 million grant in October 2014 from Power Africa to meet technical and legal expenses as part of former President Obama’s policy action to grace the continent. “Through a combination of financing, transaction and technical assistance, advocacy and investment promotion, Power Africa supports power sector development in Kenya. Power Africa assists advance power projects in the pipeline by increasing debt and equity financing, helping in power purchase agreement (PPA) and Government Letter of guide negotiations and providing technical and financial advisory services,” says Agency.